If you want to have a unique activity for your next event or party look no further! CT Inflatables has Dunk Tanks that are certain to bring out some good old fashion carnival type fun! 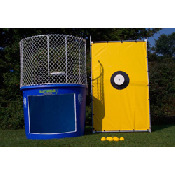 Dunk Tanks are perfect for fundraisers, but can be rented for any occasion. Schools love renting our dunk tanks for special events. What student wouldn’t love seeing their principal or teacher drop into a few hundred gallons of water? Let your guests step right up and be a part of all the action. Add a Cotton Candy Machine and really get those carnival vibes!